This past Saturday, The Bicycle Story hit it’s four year anniversary. The project launched on November 1, 2010 with the Stevil Kinevil interview. I didn’t have much plan for the site when it kicked off. I just knew the best part about cycling is the interesting people involved and I was pretty sure there were readers out there who agreed. It turns out I was right on both counts. The project has continued to grow beyond my expectations (I never would’ve guessed I’d some day be chatting about the intersection of cycling and women’s rights in Afghanistan). And the audience–you great people–has grown right along with it. Over the years, The Bicycle Story has become a platform for elevating unique voices and insider insight. The interviews have delved into critical social justice and equity issues with people such as Adonia Lugo and Ed Ewing. 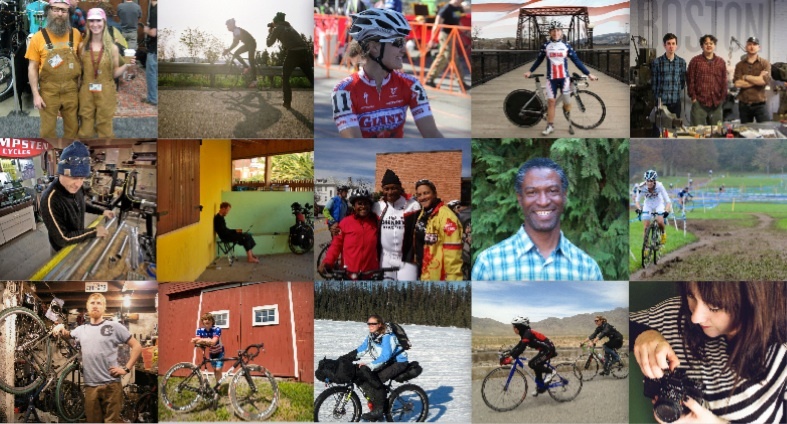 They’ve served as an oral history of cycling culture with Jacquie Phelan and Steve Garro. They’ve gone deep into the lives of cycling’s best athletes such as Jeremy Powers, Mo Bruno Roy, Barry Wicks, Ted King, and Elle Anderson. They’ve looked at the important work of advocates such as Aaron Naparstek, Nelle Pierson, and Noah Budnick. Many great adventurers have shared their epics including Nicholas Carman, Mike Curiak, and Jill Homer. Artists such as Brian Vernor and Emily Maye have shed light on their process and creative eye to the world. And the list goes on and on. So thank you for reading and sharing and appreciating and supporting this work. It means a lot and provides the motivation necessary to keep the project rolling. If you want to lend some financial support and look great doing it, buy one of The Bicycle’s Story’s brand new t shirts. In the meantime, I’ll still be seeking out and chatting up the best, most fascinating, raddest people the cycling world has to offer. The Bicycle Story Has T Shirts! I am super excited to debut The Bicycle Story’s first tee. 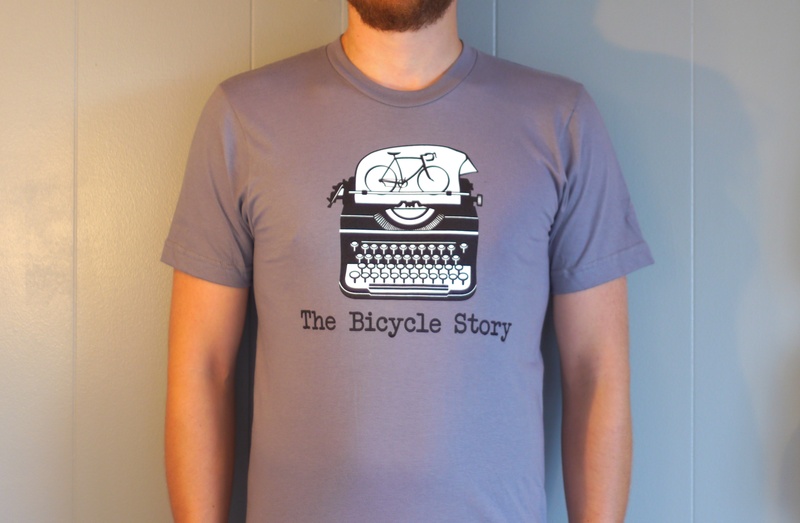 Show your support for The Bicycle Story and look good doing it with this typewriter logo shirt. These high quality and super soft American Apparel short sleeve tees were screen printed in Seattle by a great mom and pop shop. They’re available in slate gray, XS through XL. Click here to head to the shop. P.S. This seems like a good time to remind you that The Bicycle Story typewriter logo was designed by the fantastic Robert Higdon of Bunnyhawk fame. Thank you Internet for having a picture of everything anyone could ever imagine. 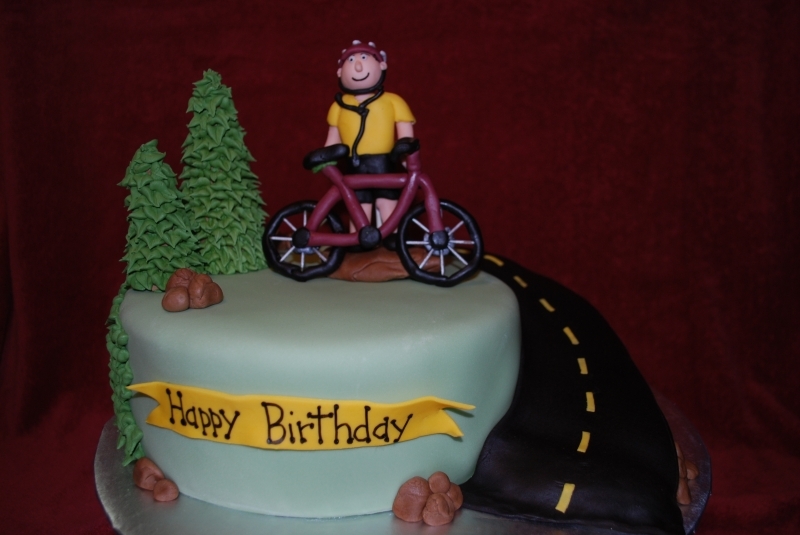 Today is The Bicycle Story’s first birthday. Technically the site went live in late October 2010, but it was a year ago today that the site really launched with its very first interview, “Stevil Kinevil: Bikes, Booze, and the Art of Heckling”. Since then, it has chugged along, sometimes with very consistent content and others, not so much at all. But hey, it’s impressive a one year old can write anything at all, let alone do so without ever pooping its pants, right? The Bicycle Story is still very much a side project for me and will still take a back seat to the full-time job when it needs to. That said, I will still be bringing you interviews with cycling’s most interesting adventurers, advocates, industry folks, racers, dirt bags, and more. I also have some ideas for some good projects that could branch The Bicycle Story off in some relevant, but new and exciting directions. Hopefully those make the transition from ideas-I-had-while-laying-in-bed-unable-to-sleep to fruition before too long. Cheers to all the readers, commenters, interviewees, and friends that helped make The Bicycle Story’s first year on earth so great. Here’s to many more!